5S and TPM provide a solution to defects, safety and performance problems in manufacturing and offices alike, to enable efficient and effective participation in TPM related activities it makes good sense to have clean work spaces that are well laid out and safe. When we think about 5S and understand that it’s geared towards enabling us to quickly identify where to locate items we need to do our jobs in a safe repeatable way, it’s easy to understand why it’s valuable. Everyday people practice 5S without even thinking about it, when were at home we always know where to find the knives and forks and I bet their always clean too. Bringing levels of organization and tidiness that we are already accustomed to into the factory or office is not a natural thing for some reason, but just think about what our homes would like without some of the simplest organizers, that would be crazy right! There are Five Pillars below all beginning with the letter S and that why their called 5S (just in case your new to 5S) , with the two most important elements being Sort and Set as they are the foundations for zero defects and zero accidents when understood from a TPM perspective. 5S is often referred to as the foundation of TPM and that’s for good reason, as you develop TPM and Operator asset care capabilities without 5S principles you will find it difficult to get off to a good start or sustain new standards, without standards improvement is not possible. Sort is about removing all items from the work space not required to complete the current production activity, this includes raw material, products, tools and paperwork. Often this pillar is misunderstood and people find it difficult to distinguish between what is needed and what is not. Keeping items lying around that are not required creates waste and costs money, the trick is learning to avoid having to sort in the first place especially when its in process inventory or finished goods, thinking ahead and planning is a great way to succeed. Set follows sort for the logical reason that once sort is completed only the items you need are left and therefore they are the items that need to have standardized locations when you want find and store in the future. Locations typically have an ergonomic consideration with users deciding where things go . Shine is the process of sweeping, wiping, and polishing surfaces within the agreed area of responsibility or zone of an employee. Dirt dust and other contaminants create accelerated deterioration by masking problems that could otherwise be observed and then improved. For Manufacturers Shine links very closely with the reduction of product defects due to jams, crashes and contamination. Not to be over looked Shine plays a significant role in saving labour too by reducing deep clean events that typically take large chunks of production time out of a production schedule. Standardize is about creating the visual indicators and written standards around cleaning and locations for production or process materials (raw and finished goods), tools and paperwork. Typically cleaning standards using photographs with captions stating the consequence of failure to clean help solidify this process. An example of the value of having documented standards – I am asked to clean an area without a visual standard or instruction, I may not understand what exactly is meant by clean but I do my best and I think I have done a good job, but the reality may be that I missed critical to quality areas that are hidden from view or I used the wrong cleaning product like non food grade when it needed to be food grade. With visual standards there is not grey area and this helps to maintain the agreed standards. 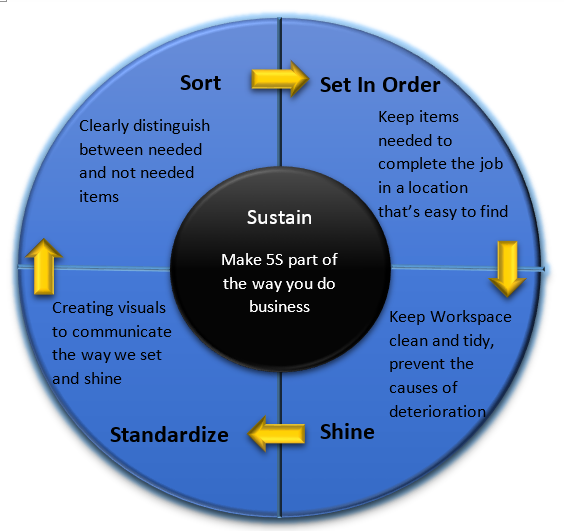 Sustaining the gains and identifying the need to improve is what the pillar of sustain is all about, the most over looked pillar of the five usually resulting in a failure to sustain standards that make 5S value adding. From my experience it takes time to change the way people work, if your introducing 5S its a culture change, like all change there is a sensitive time where adopting new ways of working can diminish and we revert to way we feel most comfortable. Increased communication, involvement and regular feedback will be needed to enable teams to successfully have 5s as the way we do business here. We really hope you have found this article of value and that it has inspired you to learn more about 5S and TPM, just remember the hardest part of any journey is getting started but once begun you will learn it’s an enjoyable and rewarding experience that can improve your organization’s culture and performance in a very positive way.